I must confess I am a foodie. I love food, I enjoy trying all sorts of delicacies and am that annoying person who takes photos of the food they are about to eat. So it will come as no surprise to those who know my true identity that I will be doing a series of “Foodie Posts” in my travels, and this is my first. Paan is more commonly known as “Betel Leaf”. It’s a leaf, that is usually eaten wrapped around some sweet filling (meetha paan) or tobacco. It’s like a digestive at the end of the meal, and can also freshen the breath. So each night after dinner, my family heads out for paan. It’s quickly become my favourite time of the day. 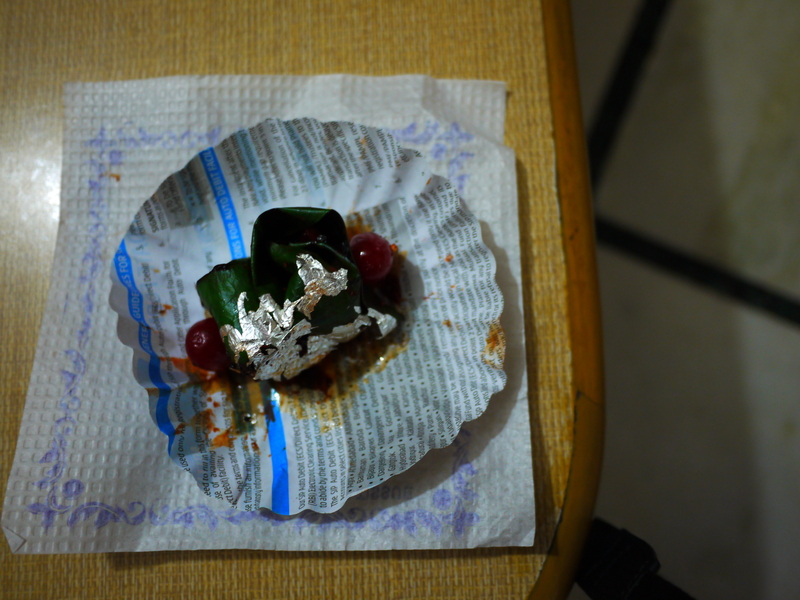 For me, its meetha paan all the way….. but which meetha paan to have? The are a range of different fillings to select from. 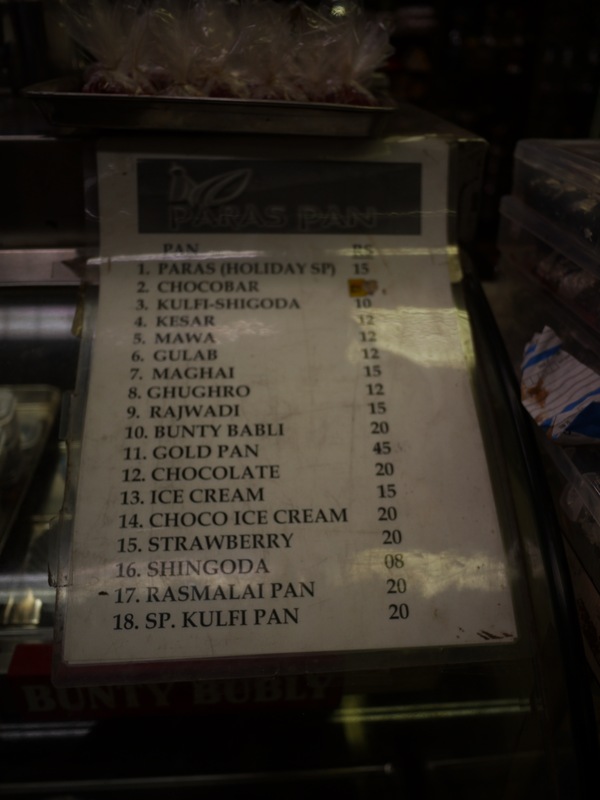 Here is the list from my local paan wallah. So what does it taste like. The actual leaf can be just a touch bitter, a little like a light antiseptic. But it holds, such a sweet and flavoursome filling. 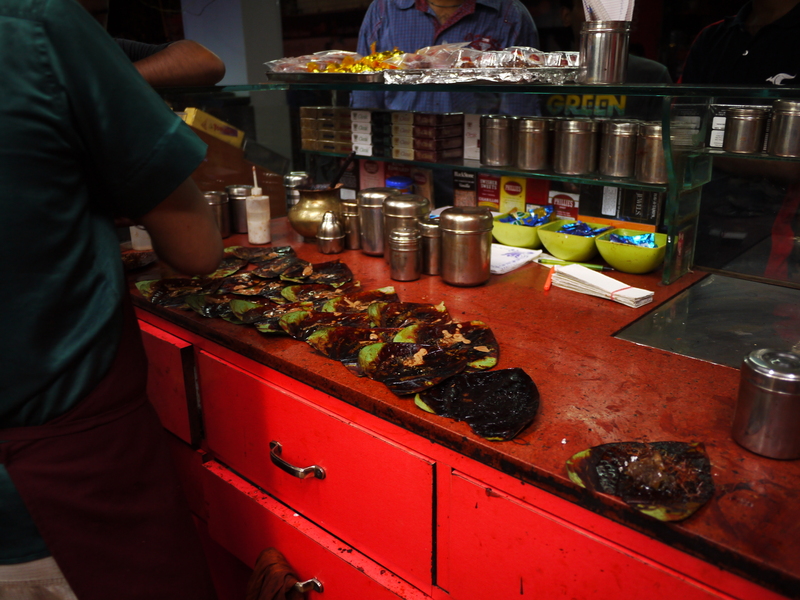 Depending upon which type you choose, paan can be bitter, sickly sweet, spicy, creamy… anything you choose. Each night I have been working my way through the selections on offer. So far, my favourites are the Kulfi Paan, which like the ice-cream, has a sweet and nutty flavour. Also high on the list is the Gulab Paan, which is sweet but also scented with roses. 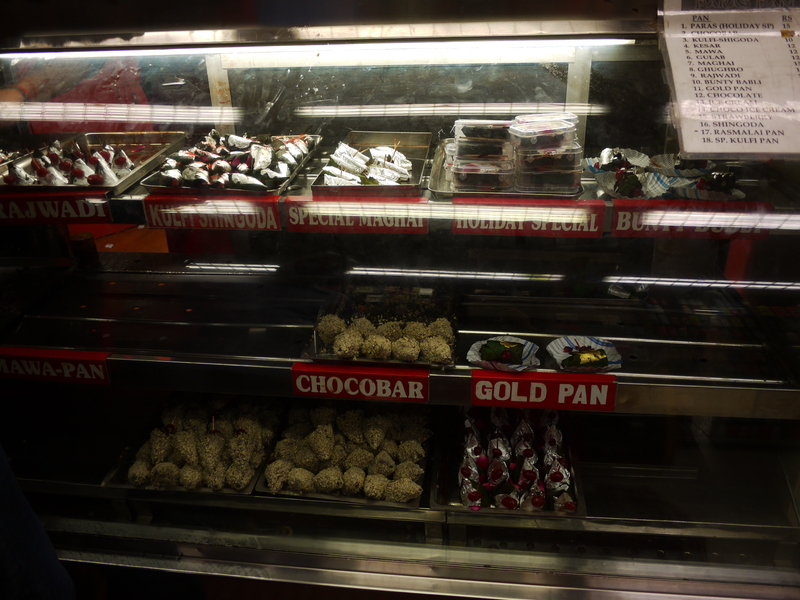 Far down my list of favourites are the new age Paans, that are dipped in chocolate. Last night I had a Vanilla Paan that had been dipped in milk chocolate. I never thought I would find anything flavoured in chocolate that I didn’t enjoy, but alas, now I have. For today I have the Bunty Babli Paan. It is two Paans delicately wrapped together and was sweet but not too much. You are supposed to eat the Paan whole, but its a little much for my little mouth, so I manage it in 3 bite size chunks. This can be done only because it is so skilfully wrapped. Each one is put together from a flat leaf, the filling is layered on in a neat pile, and then it is wrapped into a tight package that holds together. 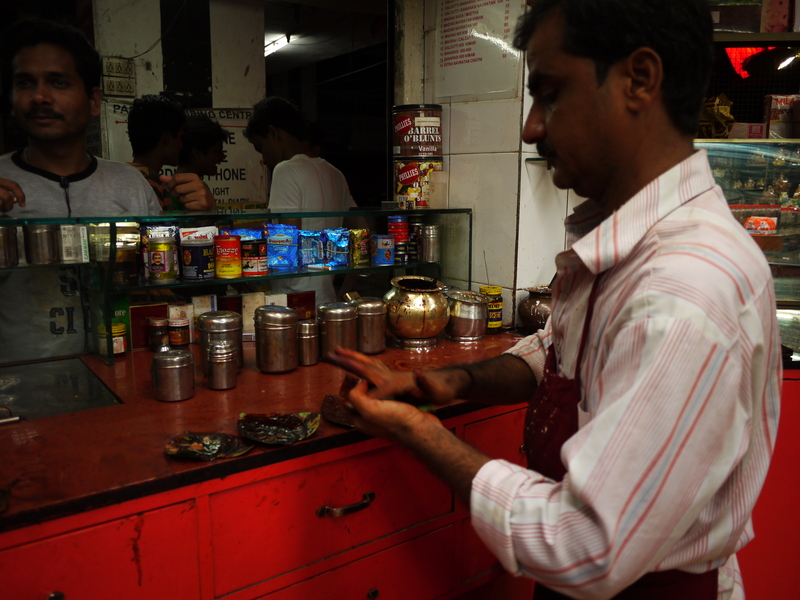 Below are my local Paan wallahs, practising their trade. 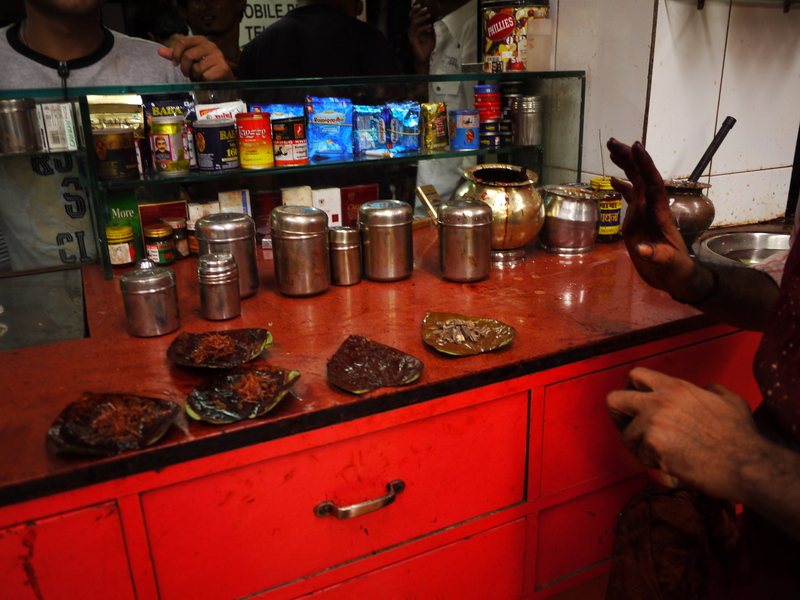 The only thing to be wary of with Paan, is that it is notorious for damaging your teeth. This has less to do with the actual Paan leaf, and more do with the rich and sweet fillings I suspect. Given the amount of dental work I had done before arriving in India (see this post), I may need to curb my Paan loving ways, but I am not ready to …. at least not just yet. ← Are women really impure in the eyes of god? Paan listings and photography is fascinating for Paan lovers. Though I like Paan, I prefer the non masala stuff. I have a pretty creeper at home, which gives sweet Calcutta paan. Just pluck and chew, and it is heaven! I am so very jealous. I just had the most fantastic Kolkata Meetha Paan ice cream here in Mumbai, what I would give to have a plant. Oooooh another lover of the foodie posts here! And whetting my appetite for planning that trip to India. Mmmmmm. i wonder if it is related to the betel nots that everyone chews in papua new guinea ? it gives them a mild high and stains the mouth a reddish colour. people who have chewed on them for years have rotten teeth so i suspect it may well be the betel which is bad for your teeth? aside from all that, it all looks and sounds delicious!!! I think it is the same thing. The betel nut is sometimes use in the filling and it’s a glorious red. Oooh! Foodie posts! Awesome. I’ll be looking out for those. Isn’t betel juice the stuff that stains your teeth red?